In the 2019 Chevrolet Volt, buyers get a limited range electric car with a gasoline motor/generator, giving owners the best of both worlds. 2019 Chevrolet Corvette vs. 2019 Chevrolet Camaro: What's the Difference? More separates these two than a back seat. The 2014 Chevrolet Volt is a 5-door hatchback with a plug-in hybrid drivetrain. But a significant electric-only range, which is now up to 38 miles for the 2014 model year, allows the Volt to run solely on electricity from the grid and operate like a pure EV. If the juice runs out, the Volt recharges its batteries and runs down the road with the help of its gasoline-powered engine. With a full charge and a full tank, the Volt has a 300-mile range that easily outpaces any production EV. The all-electric Nissan Leaf, for instance, has a range of about 80 miles. If the Volt is driven less than 40 miles between recharging sessions (20 miles each way to work, for example), the gas generator will never require usage. In that case, the Volt operates as a pure EV with zero emissions. If the Volt is being driven for more than 40 miles between recharges, then the range-extending 4-cylinder engine will be used, requiring an occasional trip to the gas station. Harnessing the best of two worlds, the 2014 Volt is a viable and attractive solution within green motoring. And Chevrolet offers lease deals on the Volt that take the sting away from its high sticker price. After a few changes for 2013, the Volt is unchanged for the 2014 model year. 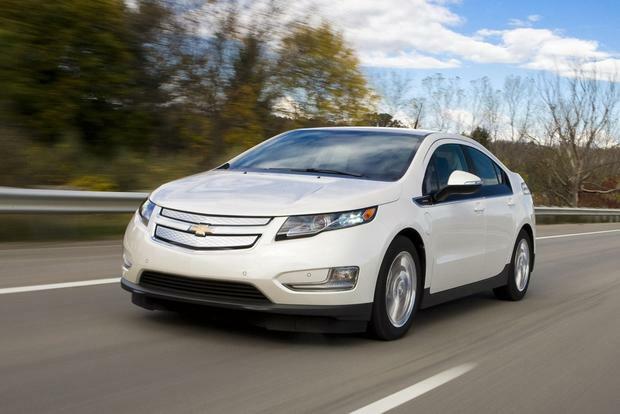 The Chevy Volt is propelled by an electric motor making 149 horsepower and 273 lb-ft of torque. This unit is powered by a 16-kWh lithium-ion battery pack fitted in the central tunnel and under the rear seat. 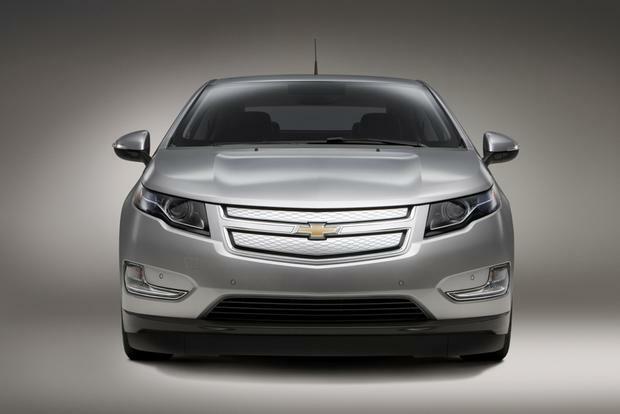 The Volt can travel 30 to 40 miles at speeds of up to 100 miles per hour on pure electric power. As the battery becomes depleted, a gasoline-powered 1.4-liter 4-cylinder becomes an alternative power source for the electric motor, giving it a range of more than 300 miles. This engine will also provide some direct power to the wheels at certain speeds. The Volt's battery back can be recharged in about 10 hours using a standard 120-volt outlet. As far as efficiency, there are two distinct measurements for the Volt. Running on electricity from a plug-in charge, the Environmental Protection Agency rates the Volt at 98 miles per gallon equivalent in combined city and highway driving. This means that the Volt can go about 98 miles on the electrical equivalent of the amount of energy in a gallon of gasoline. Once the battery charge runs out, however, the Volt achieves less impressive fuel economy than some typical non-plug-in hybrids. It's rated at 35 mpg city/40 mpg hwy when using its gasoline motor alone. 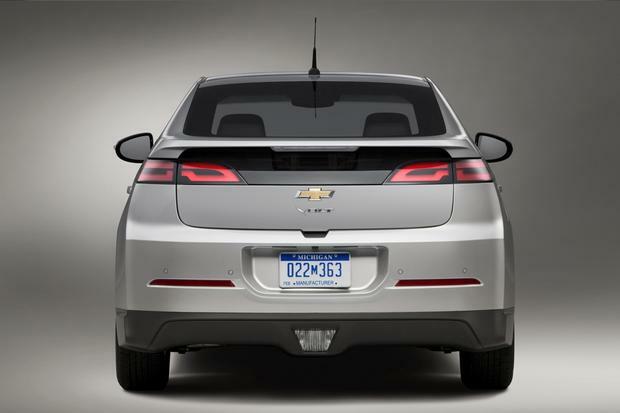 The 2014 Chevrolet Volt skips trim levels, coming instead in just one basic configuration. From there, drivers can choose among various options. 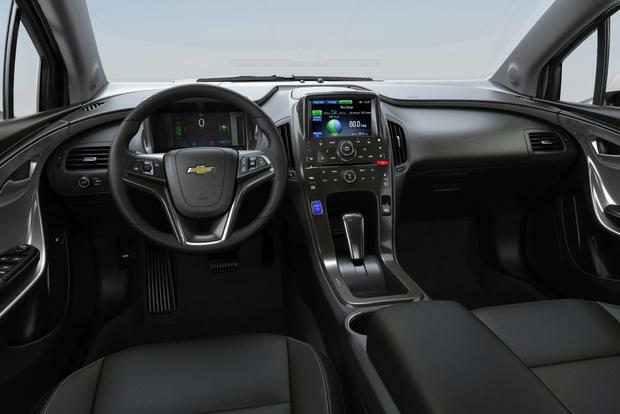 The Volt boasts a long list of standard features, including 17-inch alloy wheels, GM's MyLink infotainment system, Bluetooth, automatic climate control, cruise control, a remote starter and a center-mounted touchscreen. Automatic headlights and heated mirrors are also standard. There are three major option packages. The Comfort Package adds a leather-wrapped steering wheel and heated front seats. Drivers who want even more luxury can get the Premium Trim Package, which adds leather seats and a rear center armrest. And for safety-focused drivers, an optional Enhanced Safety Package includes a rearview camera, rear parking sensors and available lane-departure and forward-collision warning systems. Options that aren't bundled in a package include a navigation system and a 7-speaker Bose sound system. Occupant protection comes from eight airbags, including two side curtains and two at the driver's and front passenger's knees. 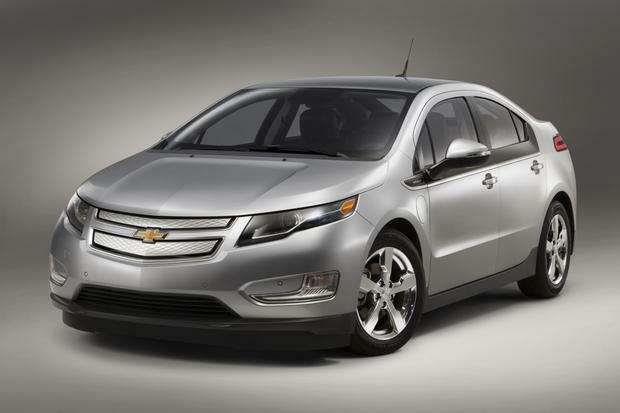 The Volt is also equipped with ABS, stability control and OnStar emergency telematics. In government crash tests, the Volt earned a 5-star overall crash safety rating. That rating includes a 5-star side crash-test rating, a 5-star rollover rating and a 4-star front crash-test rating. Most noticeable about driving the Chevrolet Volt is its superb off-the-line acceleration. This is a common trait among electric vehicles due to their high torque output at low engine speeds. For the same reason, the Volt is an assertive left-lane passer. The acceleration contributes to making this car positively fun to drive. The Volt's ride is smooth and quiet, especially in all-electric mode. And the change-over to generator mode is almost seamless, preserving a ride that feels refined in most driving conditions. The Volt's road manners are nicely balanced. Its well-tuned suspension makes it a capable handler, able to take corners with confidence. Road grip is good, and body roll is minimal. Despite its hefty weight, the Volt feels reasonably nimble at virtually all speeds. The only peculiarity is the twitchy feel of the Volt's brake pedal, which mainly can be attributed to the car's regenerative braking technology. The front seats are firm and well contoured but lack any power adjustments, which is a surprise considering the Volt's higher-end overall package. The back row is composed of two bucket seats divided by a center console that hides the car's massive lithium-ion battery beneath it. Head- and legroom are in short supply for both rows. And getting in and out of the back seat takes extra effort because of the car's low-slung roofline. The rear cargo hold is accessed through a convenient hatch, but the storage area is only 10.6 cu ft. The rear seats fold down to expand this space, but not enough to call the Volt spacious. Nissan Leaf -- As the first and only mass-produced pure electric car for the U.S., the Leaf delivers a range of about 80 miles with zero tailpipe emissions. But with that comes a lot of range anxiety. The Leaf does not come close to the Volt's 350-mile cruising range. And the Volt's dynamics are skewed in a sportier direction. Toyota Prius Plug-In -- The Prius plug-in offers only one-third of the Volt's all-electric range. But operating as a normal hybrid, its fuel economy is about 35 percent higher than the Volt's in gas-generator mode. The Prius is also less expensive and offers much more cargo space. The Chevrolet Volt comes in only one trim level, but it offers multiple standalone and packaged options. We recommend adding the safety package to combat the Volt's poor rear visibility and the optional navigation system, because you never know when you'll need it. These enhancements bolster the Volt's already comprehensive list of amenities, making it a complete package.